I've been making green tea yogurt like nobody's business. And I can't stop eating it! Or is it because I can't stop eating it that I'm making green tea yogurt like nobody's business? I can't believe I didn't think up the idea myself. I've made green tea cake and green tea cookies before, and have been meaning to make green tea truffles, but green tea yogurt? Never occurred to me until a few weeks ago when I went to an Argo Tea and tried their Green Tea Strawberry Yogurt. It came with a tiny serving of toasted oats and it was just the right combination of flavors. But, I could've done without the strawberries, they were interfering with my yogurt a little bit, and I wanted the green tea flavor to be more pronounced. So, I made my own. First, you'll need some plain whole milk yogurt. And some matcha = Japanese green tea powder. Make sure it's well-combined to prevent lumps later. I'm not doing such a good job in this photo. Isn't it pretty? I love the green streaks against the white. I was so excited to eat the yogurt, I forgot to take a picture. If you can wait, make some toasted oats to go with the green tea yogurt. It's delicious without it but seriously divine with some of this crunch. Rolled oats, maple syrup, dark brown sugar, vanilla, and ground cinnamon. Spread it on a baking sheet and bake at 350 degrees for 18 minutes. You'll want to take it out after 9 minutes to stir it up so that it doesn't get burned or toasted on just one side. After making toasted oats for awhile, you'll start to trust your nose on when to take the oats out of the oven. My first few batches were actually too toasted and tasted a little burnt. I ate them anyway. Cause these little suckers are addictive on their own! Especially when you get it right and take them out at just the right time. YUM! 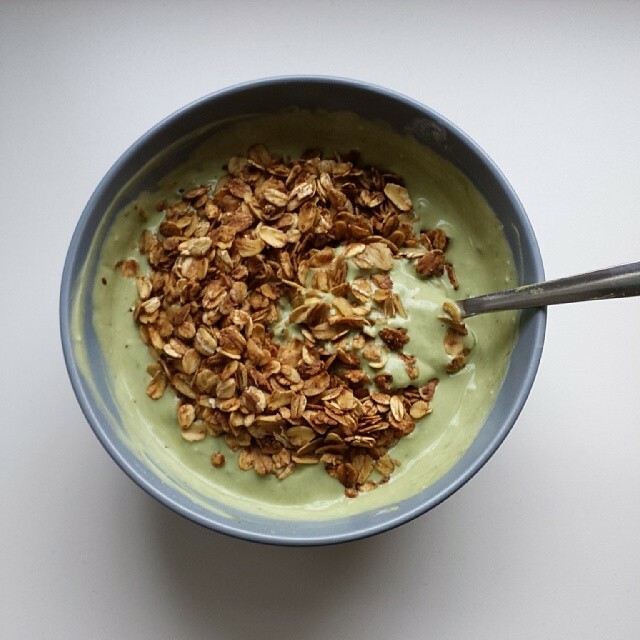 Hope some of you try this green tea yogurt with toasted oats! I've been eating it for the past few weeks and haven't gotten sick of it yet. That's a good sign, right? 1. In a small bowl, combine matcha and maple syrup. Mix in yogurt. Eat plain or top with some toasted oats. 2. For the toasted oats, combine all the ingredients in a small bowl and mix until everything is evenly distributed. Spread on a cookie sheet and bake at 350 degrees for 18 minutes, stirring after 9 minutes.